With winter storms on the horizon the demand for off-grid home solar backup systems are also on the rise. Backup solar generator for your home or small business 4.8 kW / 4,800 watts of dependable automatic battery standby electricity. Backup system can come in handy when bad weather or other conditions interrupt the utility electrical service. Home or business owners can find themselves unable to power critical load appliances and lights. This situation can be serious if critical applications such as medical devices, telephone, home office computers, sump pumps, or refrigeration are threatened. This emergency backup solar power systems is one of the best values on the market because it comes matched with ground mount solar panels and comes with a frame to secure the solar panels. This backup solar kit is even more comforting because it has a Magnum energy MMS pure sine wave inverter. This easy to use, solar battery backup power generator provides a reliable base for your home energy needs. The backup solar power generator is designed to accommodate most home small appliances. There is enough surge power to start sump pumps and freezers. The surge voltage is the startup wattage used by a electric motor to start the cycle. A freezer or refrigerator compressor motor will cycle on and off creating an extra demand for power. Once the motor is running, the surge will die down to a steady flow. If you feel you need a home standby emergency generator for storms and expect the grid power down for days, this off-grid solar backup system will work for most homes. A fossil fuel generator can be very noisy and if the power is down in your area that means the gas pumps are also not working. The backup solar generator comes with a flexible tether to the solar panels which can be set up in min in an emergency power outage. The MMS Series pure sine wave invert on our backup solar emergency generator kit is ETL Listed to the stringent requirements of UL/cUL 458, CSA C22.2 #107.1-01 and meets the KKK-A-822E standard. This home solar backup power system comes complete with its own solar panels and optional ground rack. IronRidge UNI-GR/02A universal ground mount racks (Optional at checkout) is constructed of heavy aluminum material with stainless steel durable fasteners. Easy to set up, the backup solar kit will safely stand up to virtually all-weather conditions including 125 mph hurricane winds if you properly secure the frame to the backup solar rack to concrete footings. IronRidge solar racks (Optional at checkout) are designed to hold these 90 watt solar modules as well as allowing you to add an additional module at checkout. 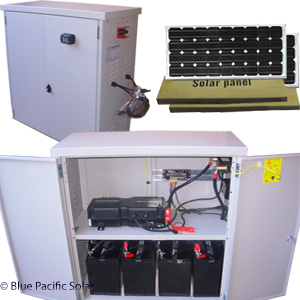 The solar rack to this backup power set is easy to assemble because of carefully engineered parts that are cut with CNC equipment. Storms, blackouts, or hurricanes, when an emergency blackout happens at your home or business, the 4800 watt backup solar generator is available to start powering critical loads from the batteries until the power comes back on. When the power goes out, lights, refrigerator, computers, television, alarm systems, automatic gate or garage openers, all can continue working with your home backup solar system.